A project by myself, Jordan Chen, and Colin Stricklin for a Discovery & Invention class at Georgia Tech. This project spanned a period of six weeks (Oct. 22, 2018 - Nov. 30, 2018) where we went from brainstorming and ideation, all the way to implementing our design to test it. Continuing on from a previous project where we studied crosswalks as a transition space, myself and a new team set out to create a design artifact about crosswalks. This artifact could be used as a way of critiquing crosswalks, improving them, or probe further into the transition space. Crosswalks are already fairly functional spaces - people get across them in an efficient and safe manner. While there is room for technical improvement, we, as design students and not civil engineers, were not qualified for that. What we could do was make a crosswalk a more communal and creative space. Some our initial thoughts revolved around making a VR game similar to frogger but soon moved to what could we add to a crosswalk to make it either creative or communal. Then we thought about games that could be played while at a crosswalk. Our thoughts quickly moved to what could we do in a crosswalk that allowed people to express themselves and create a communal feel. The four ways that we looked at a crosswalk while trying to figure out what to do. We decided to stay with a crosswalk because we saw a lot of potential in what they could be. We looked at the crosswalk from a variety of angles- aesthetic, practical, communal, and political. 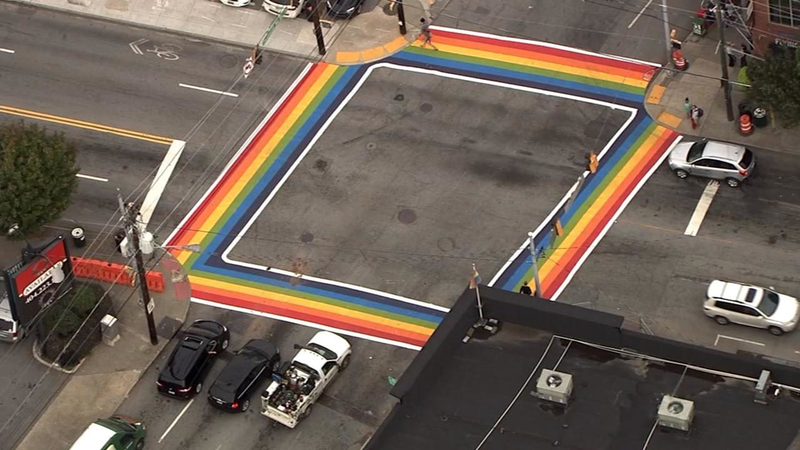 Other creative crosswalks, like the rainbow crosswalk on Tenth and Piedmont or some of the other painted crosswalks over in Decatur, served as strong influences. We talked about putting LED’s under the crosswalk (in a scramble) that responded to people stepping on them. People could work together to create images that could be exported to their phone. We decided against this due to technical concerns, the little amount of time allotted to cross the street, and safety concerns. The more we looked into making a creative crosswalk, the more issues we ran into. While creative crosswalks had been done before, there were a series of hoops to jump through. We called several city organizations, looked into applications for city art projects, and read up on crosswalk laws before coming to conclusion that safety was just as much, if not more, important than whatever creative concept we came up with. And politics played a big role in creating a crosswalk. A rainbow crosswalk in Montreal. A crosswalk painted like an optical illusion. What all of this research led to was that we could not actually make a crosswalk. So we settled for the next best thing - a heavy pedestrian intersection where bikes, scooters, and people often collided. Lives were not at stake in a pedestrian intersection. After surveying several areas of campus, we decided to use the area outside the north end of the CULC. This area is extremely busy during class changes and is basically a free for all, chaotic area where several bike collisions have occurred. Then we started to think about what we could do with this area. It wasn’t really a crosswalk, but it was a pedestrian transition space that needed improvement. We started thinking about the communal and aesthetics aspects first and draw influence from the Tree of Life in Disney’s Magic Kingdom. The tree serves as a giant structure that forces people to walk a certain direction through that area of the park. We liked the notion of this and started to think about what we could use as our center piece to guide people. We looked at the pianos left in random places in Atlanta and large graffiti boards before settling on a Thanksgiving tree, or a tree-like structure where people write what they are thankful for on a leaf and hang it on the tree. To help improve traffic flow, we decided to use this tree as a center to a roundabout. This roundabout would have pedestrian lanes and bike lanes to help organize traffic, or at a minimum, slow traffic down. The Tree of Life at Magic Kingdom. A piano placed on the Beltline by Pianos for Peace. We placed the tree in what we considered as the best central location. Then, we allotted a large round circle for pedestrians to walk in. Surrounding that would be the bike lane. Entrances and exits to the roundabout would look similar to that of an actual roundabout. A sign informing people who were walking by what they could do with the tree. Colin and I setting up the marks on the ground. Colin and I setting up the tree before classes started. A cone that flew away during the course of our experiment. We woke up early on the Tuesday before Thanksgiving to set up this project. The goal was to run it from nine to noon. We choose this time because people would be in a more friendly, happy mood and there wouldn’t be as much of a rush. Although more people would have led to more data points, having less of a rush decreased our chances of causing more issues than good. The experiment ran over the course of two class changes so that we gathered data points during a rush and also during a lull. The setup started with the tree in the middle. We propped a large branch up in a Christmas tree stand and tied a few leaves to it to give people the sense of what was happening. Next, we dragged a table over and placed the leaves, ribbon, and sharpies on the table, as well as hung signs. We used spray chalk to draw out the roundabout lines and then setup tiny cones to give a bit more of a 3D feel, since the lines were hard to see until you were on top of them. Once setup, we stood by the tree to help encourage people to come hang leaves. Between the tree, the cones, and our own bodies, the setup was difficult to miss. Once the experiment was setup, monitoring it was easy. One or two of us always stood in the middle to talk to people who were using the roundabout (or not using it) and those who were filling out leaves. The other member(s) of the team were taking photos and videos and jotting down notes to review later. We took photos/videos from above, the center, and off to the side to get a variety of angles. A view from above the roundabout. A girl hanging a leaf on the tree. A biker who stopped to take photos of the setup and write a leaf. Quotes from people who visited the tree. Most people responded positively. We found that most people simply ignored the roundabout. Bike after bike whizzed by us. Pedestrians gave us questioning stares. The most influence we had was slowly down traffic as they took in the change in scenery. A few bikes responded to the roundabout and some even came to talk to us about what a good idea it was, but the majority did not. Most positive feedback came from the tree itself. People appreciated the notion of the tree and the ability to give thanks before the holiday. People had a bit more time and were typically in a better mood because of the break, so that helped us with participation. What we did achieve was simply being able to influence the space, which is all we truly set out to do. We slowed people down and made them acknowledge what was happening around them instead of barging through the intersection and risking colliding with others. During our experiment, we were approached by a couple people on bikes asking us to come speak about our project at the Bicycle Infrastructure Improvement Committee (BIIC). The BIIC is currently working on a way to get people to slow down in this area (current solution is ‘slow down’ signs) and found our approach interesting, although they pointed out a number of flaws, such as the inability for fire trucks to get through. They also pointed out more of the political issues that go into making something like this actually happen. One guy really took to our idea and sketched out his own similar solution (see below right). He explained that if those concrete squares were replaced by dirt or cobblestone, it wouldn’t effect pedestrian traffic, but would force bicyclists to slow down and follow a stricter path. After a while, the BIIC had to stop talking about our idea because the reality is that we would not be working on it anymore. Members of the Bike Committee discussing our project. 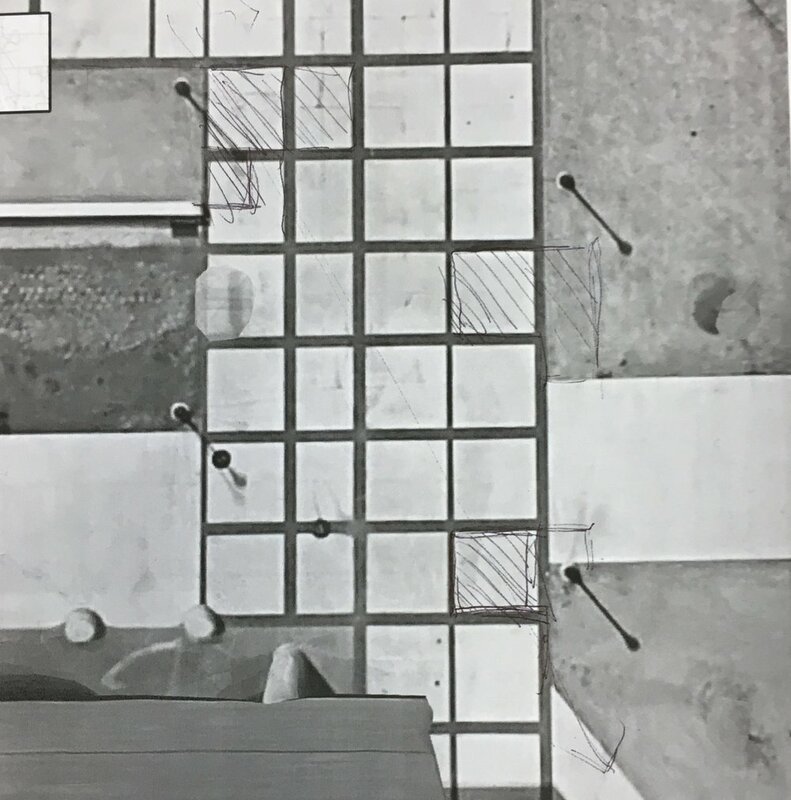 A drawing by one of the members of the committee, the shaded areas representing blocks of concrete that could be replaced with dirt or cobblestones to guide bikes in a certain manner. If we were to run this experiment again, we’d talk more to the BIIC because they seem to know a lot more about things like this than we did. We also found that the roundabout structure was not the right route, so we’d have to work on developing a different traffic pattern. The notion of a 3D interactable object in the middle of traffic proved to be the most effective part of our experiment. It checked the boxes of aesthetic and communal, but wasn’t as practical as it could have been. Working with the BIIC and running multiple experiments could lead to a solution that was practical, creative, and communal.